This is our first visit to Higgins Manor, after letting it elude us for many years. 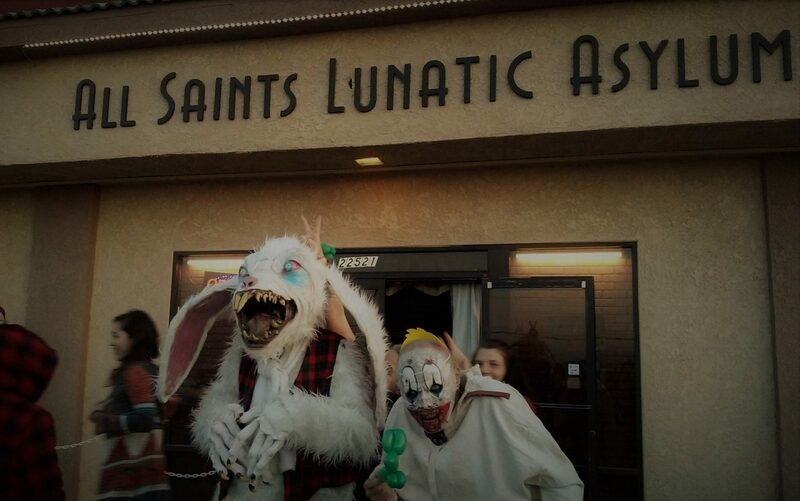 Located in South Orange County, off of the 5 Freeway, this home haunt has enough professional elements and set decor to rival that of Backwoods Maze and Rotten Apple in Burbank, CA. The difference? 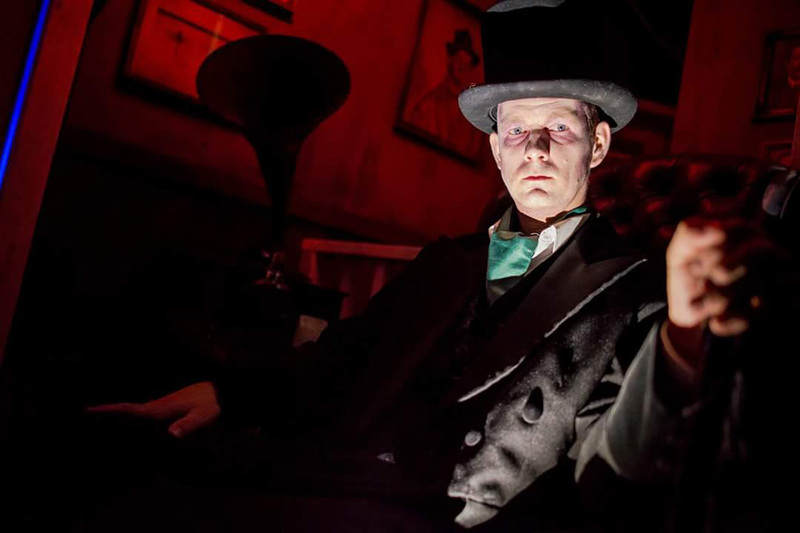 Higgins Manor contains a welcome surprise: 80% of the experience is interactive, with the scare actors engaging with the guests and making them part of the story. Higgins Manor is located at the end of the cul-de-sac; guests are encouraged to park on the cross street, which has ample parking. We arrived around 8:30 PM on opening night. The line extended only to the neighboring home and remained pretty consistent throughout the evening. The daughter of Master Higgins was out front, interacting with the guests in line. Small groups were led in six at a time. The wait for us was about 30 minutes. 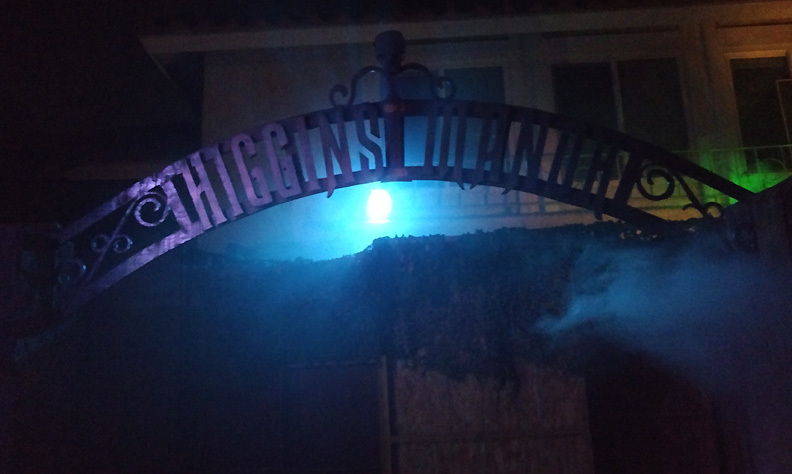 When it was our turn, we were instructed to walk beneath an arch with the Higgins Manor sign and wait by the front door, where we were greeted by the daughter of Master Higgins. She alerted us that her Daddy was looking for henchman, then told us to move into the living room, which was nicely decorated with a female skeleton - her dead sister. The daughter then asked if we wanted to play a game. When I answered “yes, I'll play with you”, she gagged, “Eww, not that way. I'm telling Daddy!” She then yelled at us to get out while calling for her Dad to be on the look out for me. 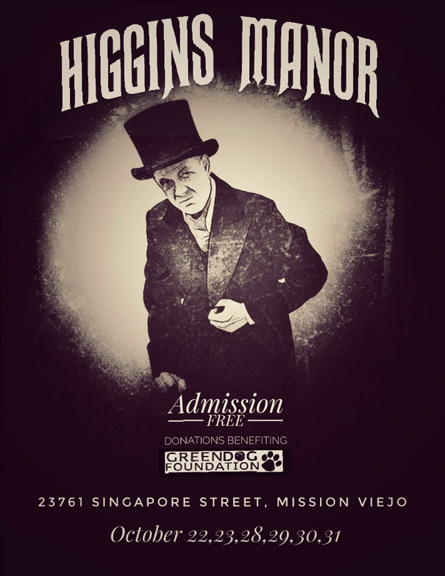 In the next room, Master Higgins, dressed in Victorian attire, told a clever story about his land being stolen from him by one James Irvine - which has a meaning to residents in the area: the city of Irvine (which is next door to Mission Viejo) is still privately owned by James Irvine and the Irvine family; therefore, it made sense to incorporate him as a character. Asked if we were henchman material, I told Master Higgins that I was appropriately dressed in all black, so our group of 6 "qualified" to move on. After some discussion and bragging about me being an Asian terrorist who kills with chopsticks, a fourth henchman showed up to check out the commotion. We followed him, and after a few more jump scares, we were introduced to a Judge. I plead not guilty, insisting that I had meant to say “tourist," not "terrorist." The Judge's face indicated skepticism, but we were allowed to exit the manor anyway. We were thoroughly impressed by Higgins Manor, especially the interactive performances by the scare actors. As with any complimentary home haunt, there shouldn't be expectations of any sort. But even we had held high expectations coming in, this attraction would have completely exceeded them - and then some. The sets and decor made sense; the characters and wardrobe were appropriate to the time line. Most of all, we were surprised to find an elaborate interactive haunted maze operating on a private front and back yard. 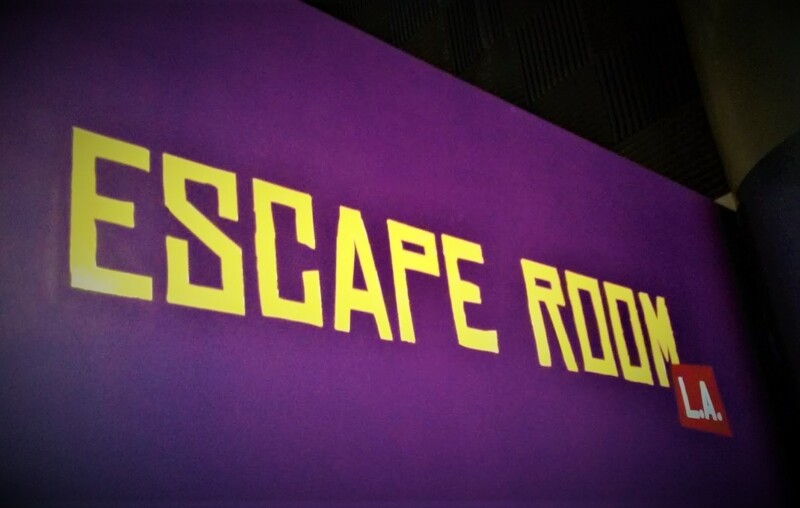 The level of immersion definitely rivals some of the best interactive/theatric attractions out there. Not only were we provided with jump scares, but many of comedic parts were improvised by the cast. Not to say that the level of comedy would be the same for another group, but it seemed as if the staff adjusted their jokes and punchlines on the spot, based on each person's situation. Higgins Manor is definitely worth the drive to South Orange County, and while you are there, tackle Boot Hill in nearby Irvine (review coming soon). Higgins Manor resumes on October 28-31, 7 to 10pm. The address is 23761 Singapore Street in Mission Viejo, CA 92691. Though Higgins Manor is free, guests are encouraged to make a donation; in return they receive a refreshment, including baked goods. Proceeds benefit the Greendog Foundation. Get more info at: higginsmanor.com. A must-see interactive home haunt!